Nidhi Samani, Sonal Mathur Megha Mathur and Aparna Patil, in collaboration with 13 other notable artists in Singapore present “Symphony in Colours”- an art exhibition of works by both established and emerging Singapore based artists, showcasing diverse styles and varied mediums including Oil, Acrylic, Pencil, Water, Chinese brush painting, Mixed Media, and more. 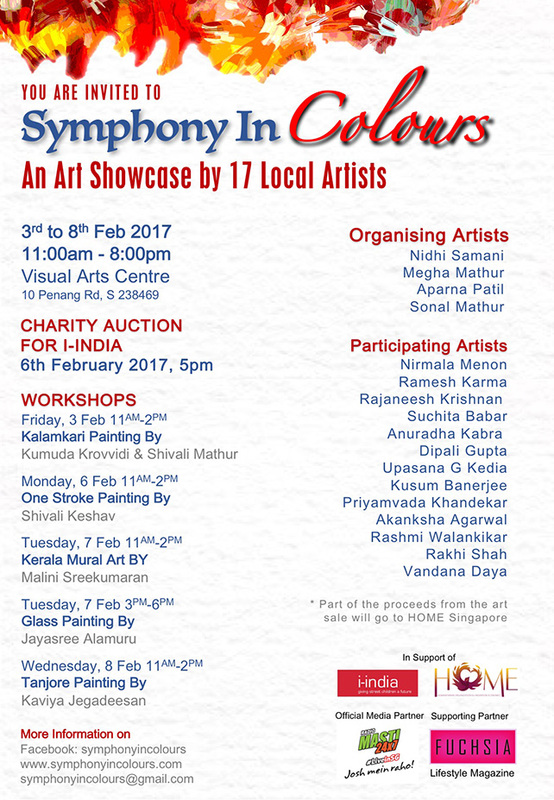 There will be a charity auction of artworks held on 6th February evening in support of I-India. A portion of the exhibition’s art sale will also go to HOME – an NGO based in Singapore.